MEET JUSTBREASTIMPLANTS.COM & DOCTOR.COM @ASPS! 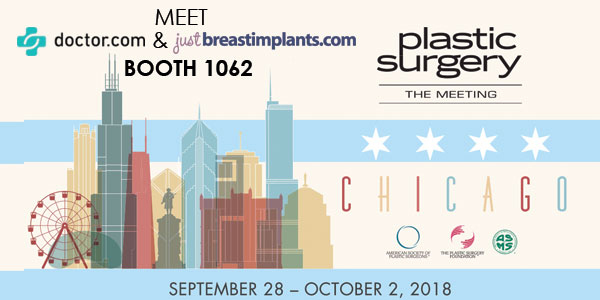 WHAT’S OFFERED: Doctor.com and JustBreastImplants.com will be offering $100 OFF any of our Digital Marketing and Reviews Packages when you sign up at the show! Meet us @Booth# 1062. – Fill out the form on this page. – Enter code: ASPS2018 in the form. – We will call you within 24 hrs to schedule a time to meet with you at the show for a quick 10 min demo. If you find we are the right marketing service for you, your $100 OFF will be applied to your contract. ABOUT ASPS:Plastic Surgery The Meeting brings together the best and the brightest surgeons in the specialty, poised to share their expertise with colleagues who arrive from 73 countries around the globe. It is the premier educational and networking event of the year, for both domestic and international plastic surgeons. Learn more HERE. * Discount applies to a 6 Month or Annual contract. Discount is only applicable towards newly purchased services; cannot be applied to services already in use. Discount is applicable to ANY digital marketing package tier: Silver, Gold, Platinum, or Platinum+. Discount is only applicable to the final month of your contract. Leave your info and we’ll reach out to schedule a complimentary marketing consultation for your practice.